Sarah Jane started school at St Marys Convent School (known as Bar Convent) in 1847. St Mary’s School was run by the Institute of the Blessed Virgin Mary, a Catholic teaching order, commenced by Mary Ward who wanted her girls to be highly educated and independent thinkers. The order promoted a special devotion towards Mary. In Australia the order is still associated with teaching and in Melbourne is closely associated with Mandeville Hall and the Loreto order of nuns. School records for St Marys Convent School exist - they tell us that she started school in 1847, but not when she left. Sarah Jane’s old alma mater still exists at 17 Blossom Street, Micklegate and its alumnae are identified as “Bar Convent girls”. In the census of 1851, Sarah Jane and her brother William Albert were not recorded as being with their father and step-mother in Huddersfield. Sarah Richardson of Huddersfield was at St Mary’s School. The whereabouts of William Albert on census night is not known. Sarah was part of the Richardson family that emigrated to Victoria, Australia on the ship Ajax in 1853. On 4 November 1854 Sarah Jane Richardson, aged 17, wed Captain William Sinnott, aged about 49. She identified her father’s occupation as watchmaker. This was a scandalous marriage as the groom had been married up until a short time previously. Six months mourning was regarded as the conventional time before a widow or widower could remarry: William and Sarah Jane married after about two months. There is no known reason for such haste. The marriage took place in the Presbyterian Church in Geelong, some distance from Melbourne, with both parties attesting that they were members of that faith. They were Roman Catholic. The absence of any member of the Richardson family from the ceremony suggests an elopement. The under-aged bride needed the consent of her father to marry before 21. Instead she lied and said she was 22 years old. She may have put up her age previously in order to find work as a governess. Employing a 22 year old would have been preferable to employing a 17 year old girl. In The Argus of 6 November 1863 a Mrs. Sinnott of Hillside Cottage, Courtney Street, Hotham advertised for a servant who can milk a cow. 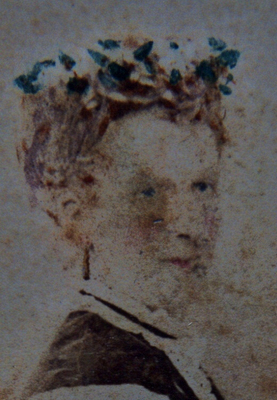 When Sarah Jane’s daughter Maude Miriam Sinnott married in Sydney, Maude's aunt Mary Ellen Richardson was a witness, indicating ongoing contact between the two branches of the Richardson and Sinnott families. Both Sarah Jane Sinnott and Eliza Richardson appear to have been living in Emerald Hill in the late 1850s and it is likely that they would have supported each other through their pregnancies. Eliza had three children between 1856 and 1861, all died young. One of them, Bernard, was buried in the Sinnott family grave confirming Sarah Jane’s continuing influence within the Richardson family. On 17 February 1855 a Madame King announced she would give a Grand Dress Ball in Emerald Hill, “tickets to be obtained at Mr. Richardson’s 34 Swanston-Street, Melbourne; and of Professor King, Dorcas street, Emerald Hill; also of Mrs Sinnott, Clarendon-street”. Obviously father and daughter were working co-operatively and one can assume that the young married mother enjoyed a good ball. Sarah's brother William Albert travelled and studied overseas between 1863 and 1866, including London and Italy where he probably studied at the Milan Conservatory of Music. He may have been financed by Sarah Jane prevailing on her wealthy husband to sponsor her brother abroad. There is no doubt that she was extremely fond of her younger brother. Sarah Jane later witnessed her brother’s wedding and assisted at the birth of her niece, Edith Ellen Beatrice, in 1871. She named one of her children after him, but sadly he did not survive past infancy. Poor Sarah Jane Sinnott had thirteen pregnancies in 17 years of married life. Her last child was a still born baby. Sarah Jane died on 23 Sep 1872. Her death entry reads: "[illegible] following operation for delivery of a still born child". The date of the funeral service was 23 September 1872 – mother and child were buried the same day in the Sinnott family grave at Melbourne General Cemetery. There is only one known portrait of Sarah Jane - by J. Botterill, photographer, who had a studio at 19 Collins St East, Melbourne 1870-1874. This is the address on the back of the portrait, indicating that it was taken near the end of Sarah Jane's life. [S621] BAC037 Background Richardson, Sarah - missing person report (1854), BAC037., Notice of missing person, Sarah Richardson, said to be English and heavily pregnant; 29 December 1854; page 590; Any information to be sent to Stephen Vincent, Irishtown, near Darebin Creek. [S903] Document - Victorian Pioneers Index, RES076. [S534] BIR073 Birth Richardson, Sarah Jane - prepared by Heather Webber, BIR073. [S131] BAP017 Baptism Richardson, Sarah Jane (IGI v5.0), BAP017. [S126] BAP015 Baptism Richardson, Sarah Jane (IGI v3.02), BAP015. [S236] DTH024 Death Sinnott, Sarah Jane, DTH024. [S3175] DTH Death Index Victoria, Australia, Sarah Jane Sinnott; 6593; 1872. [S3717] DTH477 Death notice Sinnott, Sara Jane, DTH477., Death notice for Sara Jane Sinnott; 24 September 1872; page 4; http://trove.nla.gov.au/ndp/del/printArticlePdf/5839336/3?print=n. [S3155] BUR Cemetery records - Melbourne General, Sarah Sinnott; MGC-RC-E-807-06; Grave 06; Roman Catholic, Monumental, Compartment E.
[S911] MAR090 Marriage Richardson, William and Hirst, Ellen, MAR090. [S918] MAR092 Marriage Hirst, Ellen, MAR092. [S962] MAR113 Marriage Richardson, William and Hirst, Ellen, MAR113. [S1064] MAR142 Marriage Richardson, William and Hirst, Ellen, MAR142. [S3056] MAR226 Marriage Hirst, Ellen and Richardson, William, MAR226. [S4147] MAR Marriage Richardson, Mr and Hirst, Miss, marriage notice for Mr Richardson and Miss Hirst; 30 July 1836; page 5; http://www.britishnewspaperarchive.co.uk.